No one knows the exact origin of tiramisu, which is without doubt, the most famous Italian dessert in the world. Five regions of Italy – Piedmont, Lombardy, Veneto, Friuli and Tuscany – claim to have invented it and many legends abound. According to one famous legend, this dessert was invented in the court of the Grand Duke of Tuscany, Cosimo III de Medici, at the end of 16th Century. Thus it was named zuppa del duca, meaning ‘duke’s soup’. The recipe wandered from the Tuscan capital of Florence and it is in Venice that it got its current name tiramisu (literally meaning ‘pick me up’ and pronounced ‘tiramisou’), the reason being that it was given to customers who frequented Venetian brothels, to boost their flagging energy. A much more mundane theory describes how this dessert lets you use up the leftovers of hardened cakes and cold coffee, so as not to waste anything. All you have to do is add a dash of liqueur to soften the cake and cover the whole thing cream. Well, whatever be the origin of this dessert and the version of the recipe, the key ingredient to tiramisu is ‘mascarpone’, a very rich and creamy cheese made from cow’s milk, that has its origins in the Piedmont and Lombardy regions of Italy. This cheese is easily available in all our local grocery stores. So make yourself a real dessert that is fit for a Grand Duke! Happy Holidays, everyone! 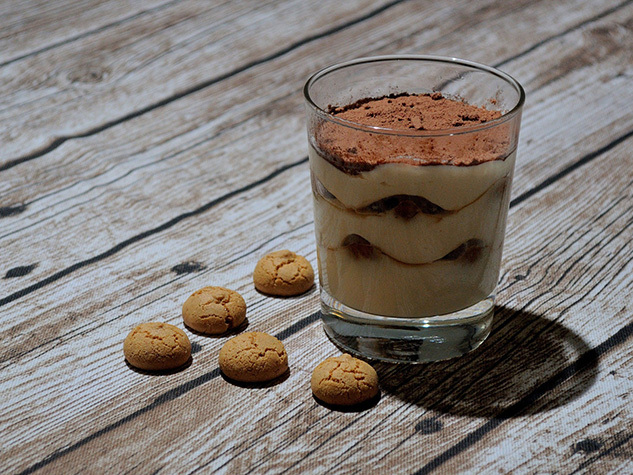 Try our recipe for Tiramisu. Originally published in the Journal de Montréal on December 18, 2010.